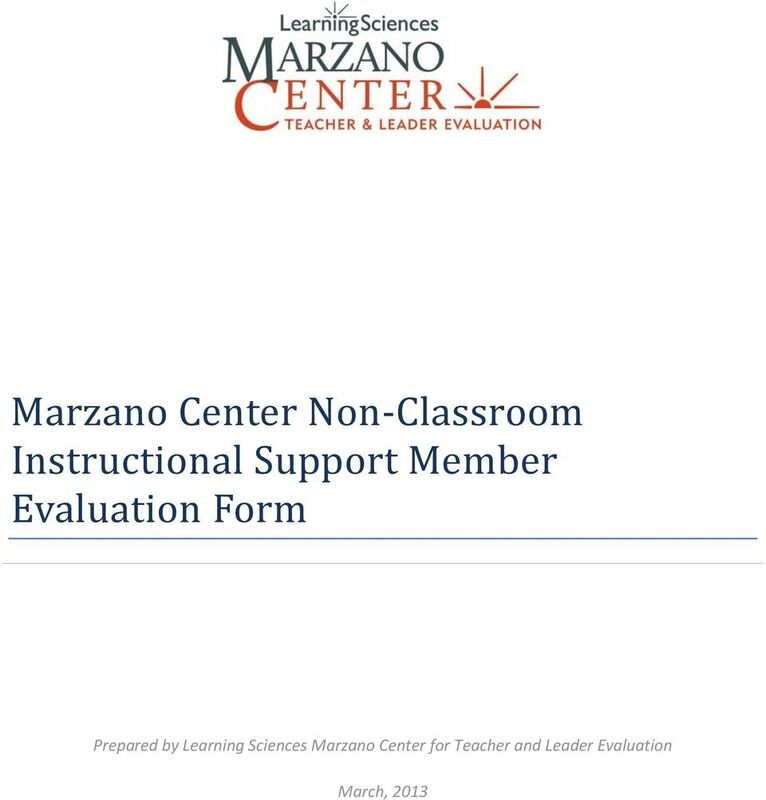 Download "Marzano Center Non-Classroom Instructional Support Member Evaluation Form"
12 3. Tracking Progress facilitates tracking of progress toward goals. 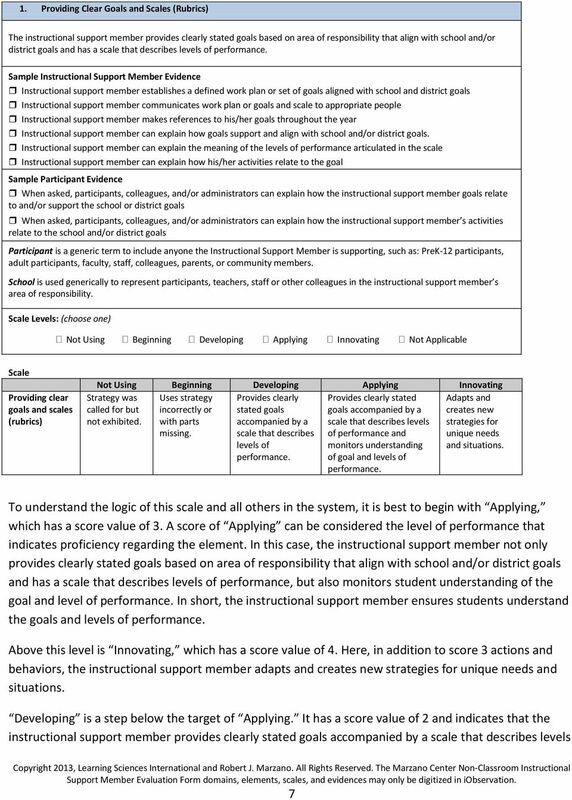 Instructional monitors progress toward his/her goals throughout the school year using a scale Instructional is responsive to participants, colleagues, and administrators regarding feedback about his/her progress Instructional actively consults with colleagues and administrators to find an optimal approach to ensure progress Instructional consults with colleagues and administrators to ensure he/she is making progress toward the goals Instructional keeps updated records (e.g., databases, data notebook, etc.) 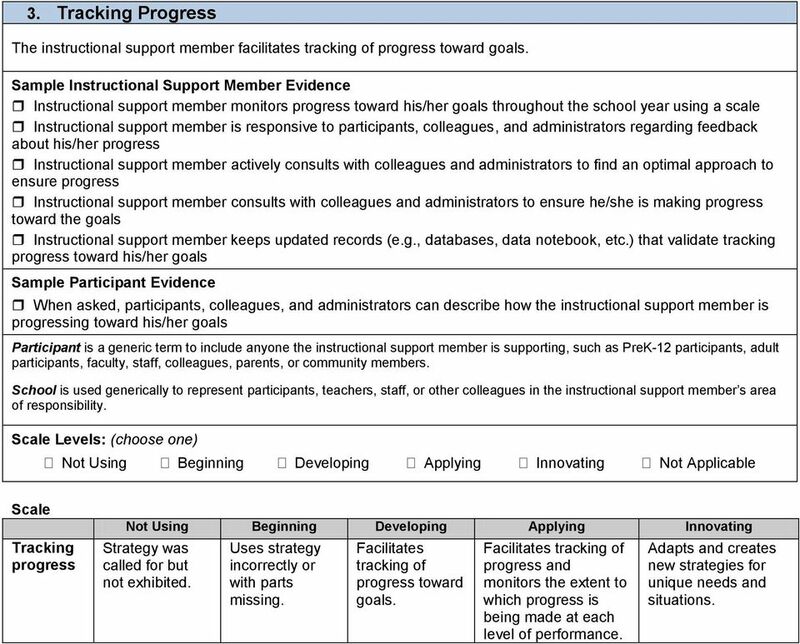 that validate tracking progress toward his/her goals Sample Participant Evidence When asked, participants, colleagues, and administrators can describe how the instructional is progressing toward his/her goals Participant is a generic term to include anyone the instructional is supporting, such as PreK-12 participants, adult School is used generically to represent participants, teachers, staff, or other colleagues in the instructional s area of Levels: (choose one) Tracking progress Strategy was called for but not exhibited. Uses strategy incorrectly or with parts missing. Facilitates tracking of progress toward goals. 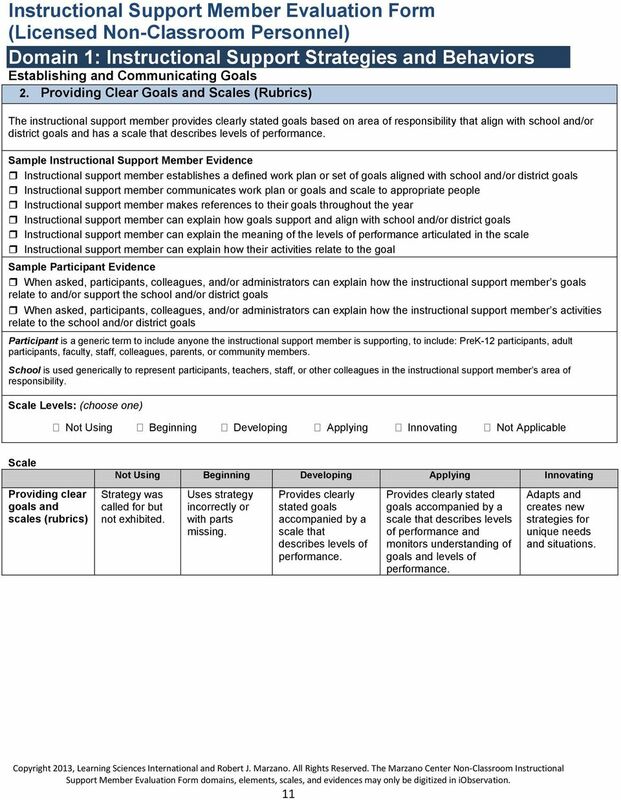 Facilitates tracking of progress and monitors the extent to which progress is being made at each level of performance. Adapts and creates new strategies for unique needs and situations. 13 4. 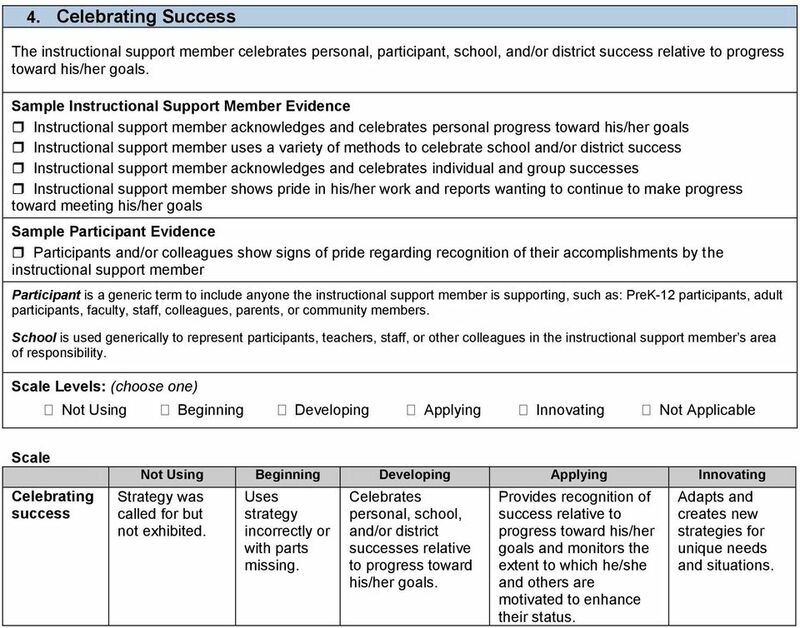 Celebrating Success celebrates personal, participant, school, and/or district success relative to progress toward his/her goals. Instructional acknowledges and celebrates personal progress toward his/her goals Instructional uses a variety of methods to celebrate school and/or district success Instructional acknowledges and celebrates individual and group successes Instructional shows pride in his/her work and reports wanting to continue to make progress toward meeting his/her goals Sample Participant Evidence Participants and/or colleagues show signs of pride regarding recognition of their accomplishments by the instructional Participant is a generic term to include anyone the instructional is supporting, such as: PreK-12 participants, adult School is used generically to represent participants, teachers, staff, or other colleagues in the instructional s area of Levels: (choose one) Celebrating success Strategy was called for but not exhibited. Uses strategy incorrectly or with parts missing. Celebrates personal, school, and/or district successes relative to progress toward his/her goals. Provides recognition of success relative to progress toward his/her goals and monitors the extent to which he/she and others are motivated to enhance their status. Adapts and creates new strategies for unique needs and situations. 14 4. 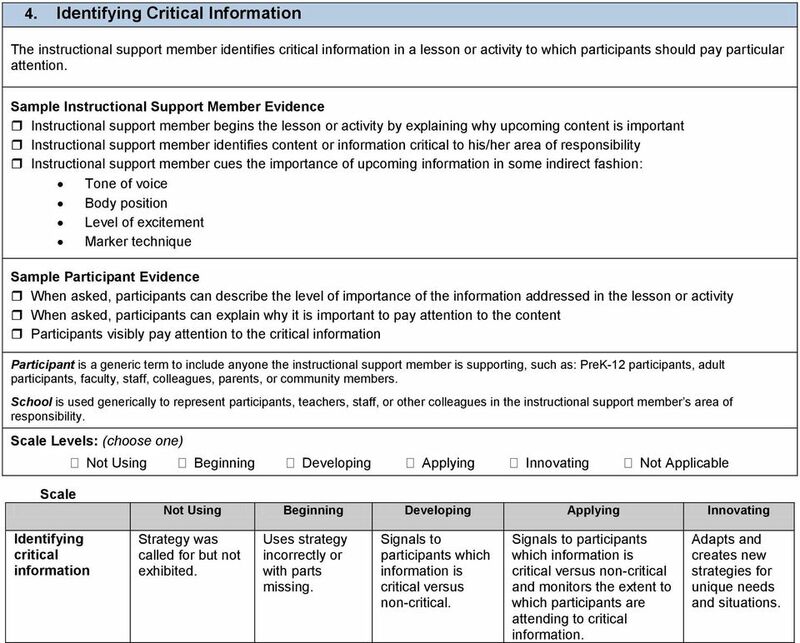 Identifying Critical Information identifies critical information in a lesson or activity to which participants should pay particular attention. Instructional begins the lesson or activity by explaining why upcoming content is important Instructional identifies content or information critical to his/her area of responsibility Instructional cues the importance of upcoming information in some indirect fashion: Tone of voice Body position Level of excitement Marker technique Sample Participant Evidence When asked, participants can describe the level of importance of the information addressed in the lesson or activity When asked, participants can explain why it is important to pay attention to the content Participants visibly pay attention to the critical information Participant is a generic term to include anyone the instructional is supporting, such as: PreK-12 participants, adult School is used generically to represent participants, teachers, staff, or other colleagues in the instructional s area of Levels: (choose one) Identifying critical information Strategy was called for but not exhibited. Uses strategy incorrectly or with parts missing. Signals to participants which information is critical versus non-critical. 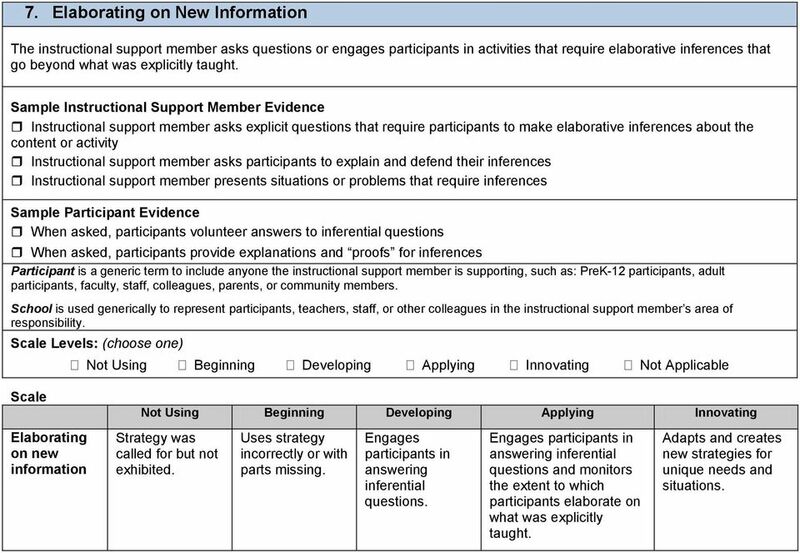 Signals to participants which information is critical versus non-critical and monitors the extent to which participants are attending to critical information. Adapts and creates new strategies for unique needs and situations. 15 5. Organizing Participants to Interact with New Knowledge organizes participants into small groups to facilitate the processing of information. Instructional establishes routines for participant grouping and interaction within groups Instructional establishes roles and procedures for group activities: Respect opinions of others Add their perspectives to discussions Ask and answer questions Sample Participant Evidence Participants move to groups in an orderly fashion and know their roles in the group Participants appear to understand expectations about appropriate behavior in groups: Respect opinions of others Add their perspectives to discussions Ask and answer questions Participant is a generic term to include anyone the instructional is supporting, such as: PreK-12 participants, adult School is used generically to represent participants, teachers, staff, or other colleagues in the instructional s area of Levels: (choose one) Organizing participants to interact with new knowledge Strategy was called for but not exhibited. Uses strategy incorrectly or with parts missing. Organizes participants into small groups to facilitate the processing of information. Organizes participants into small groups to facilitate the processing of information and monitors group processing. Adapts and creates new strategies for unique needs and situations. 16 6. Previewing New Content engages participants in activities that help link what they already know to the new content/activity about to be addressed and facilitates these linkages. Instructional uses preview question before reading Instructional uses K-W-L strategy or variation of it Instructional asks or reminds participants what they already know about the topic Instructional provides an advanced organizer: Outline Graphic organizer Instructional has participants brainstorm Instructional uses an anticipation guide Instructional uses a motivational hook/launching activity: Anecdotes Short selection from video Sample Participant Evidence When asked, participants can explain linkages with prior knowledge When asked, participants make predictions about upcoming content When asked, participants can provide a purpose for what they are about to learn Participants actively engage in previewing activities Participant is a generic term to include anyone the instructional is supporting, such as: PreK-12 participants, adult School is used generically to represent participants, teachers, staff, or other colleagues in the instructional s area of Levels: (choose one) Previewing new content Strategy was called for but not exhibited. Uses strategy incorrectly or with parts missing. Engages participants in learning activities that require them to preview and link new knowledge to what has been addressed. Engages participants in learning activities that require them to preview and link new knowledge to what has been addressed and monitors the extent to which participants are making linkages. Adapts and creates new strategies for unique needs and situations. 17 7. Elaborating on New Information asks questions or engages participants in activities that require elaborative inferences that go beyond what was explicitly taught. Instructional asks explicit questions that require participants to make elaborative inferences about the content or activity Instructional asks participants to explain and defend their inferences Instructional presents situations or problems that require inferences Sample Participant Evidence When asked, participants volunteer answers to inferential questions When asked, participants provide explanations and proofs for inferences Participant is a generic term to include anyone the instructional is supporting, such as: PreK-12 participants, adult School is used generically to represent participants, teachers, staff, or other colleagues in the instructional s area of Levels: (choose one) Elaborating on new information Strategy was called for but not exhibited. Uses strategy incorrectly or with parts missing. Engages participants in answering inferential questions. Engages participants in answering inferential questions and monitors the extent to which participants elaborate on what was explicitly taught. Adapts and creates new strategies for unique needs and situations. 19 9. Reflecting on Learning engages participants in activities that help them reflect on their learning. Instructional asks participants to state or record what they are clear about and what they are confused about Instructional asks participants to state or record how hard they tried Instructional asks participants to state or record what they might have done to enhance their learning Sample Participant Evidence When asked, participants can explain what they are clear about and what they are confused about When asked, participants can describe how hard they tried When asked, participants can explain what they could have done to enhance their learning Participant is a generic term to include anyone the instructional is supporting, such as: PreK-12 participants, adult School is used generically to represent participants, teachers, staff, or other colleagues in the instructional s area of Levels: (choose one) Reflecting on learning Strategy was called for but not exhibited. Uses strategy incorrectly or with parts missing. Engages participants in reflecting on their own learning. 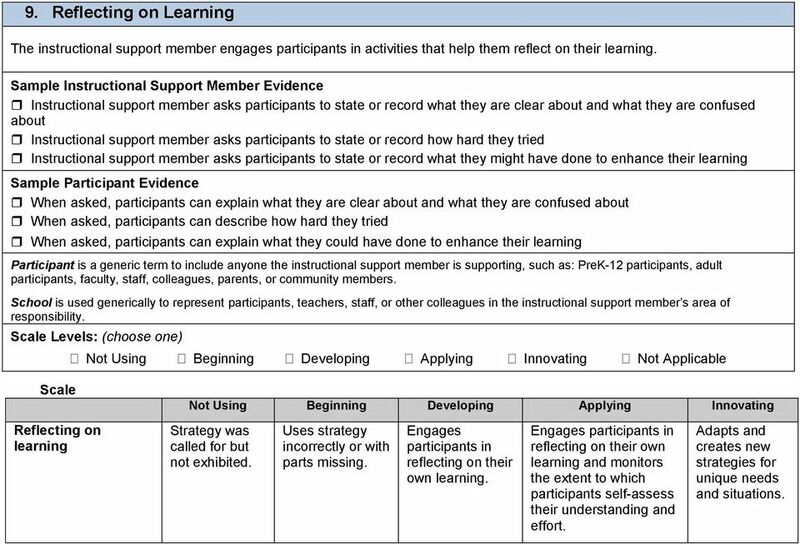 Engages participants in reflecting on their own learning and monitors the extent to which participants self-assess their understanding and effort. Adapts and creates new strategies for unique needs and situations. 20 10. 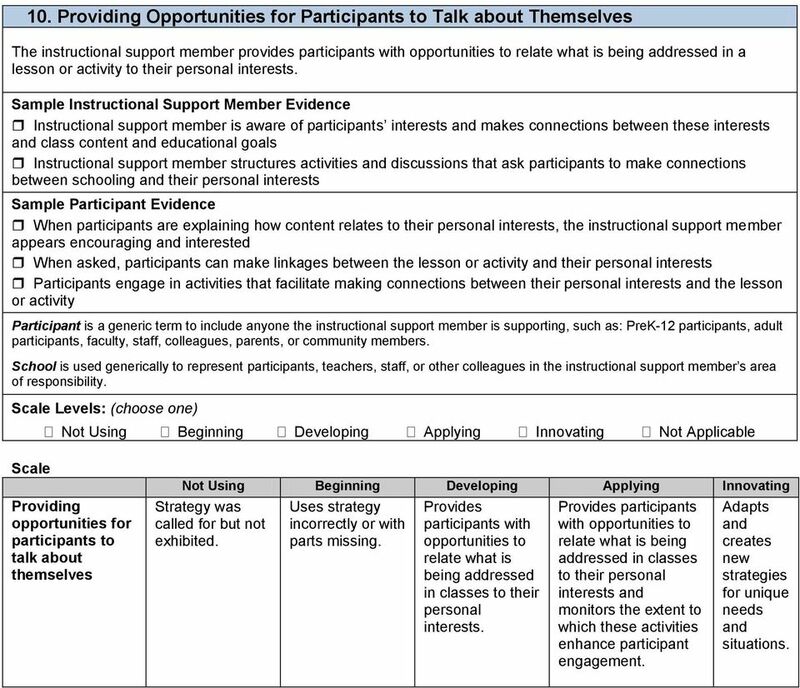 Providing Opportunities for Participants to Talk about Themselves provides participants with opportunities to relate what is being addressed in a lesson or activity to their personal interests. Instructional is aware of participants interests and makes connections between these interests and class content and educational goals Instructional structures activities and discussions that ask participants to make connections between schooling and their personal interests Sample Participant Evidence When participants are explaining how content relates to their personal interests, the instructional appears encouraging and interested When asked, participants can make linkages between the lesson or activity and their personal interests Participants engage in activities that facilitate making connections between their personal interests and the lesson or activity Participant is a generic term to include anyone the instructional is supporting, such as: PreK-12 participants, adult School is used generically to represent participants, teachers, staff, or other colleagues in the instructional s area of Levels: (choose one) Providing opportunities for participants to talk about themselves Strategy was called for but not exhibited. Uses strategy incorrectly or with parts missing. Provides participants with opportunities to relate what is being addressed in classes to their personal interests. Provides participants with opportunities to relate what is being addressed in classes to their personal interests and monitors the extent to which these activities enhance participant engagement. Adapts and creates new strategies for unique needs and situations. 21 11. Demonstrating Withitness uses behaviors associated with withitness to maintain and support adherence to rules, policies, and procedures. Instructional is accessible to parents and the school community Instructional establishes healthy professional relationships with participants, colleagues, administrators, and parents Instructional recognizes potential sources of disruption to classrooms and the entire school and deals with them immediately Instructional proactively addresses inflammatory situations Sample Participant Evidence Participants recognize that the instructional is aware of their behavior as well as the climate of the school When asked, participants, parents, or colleagues describe the instructional as aware of what is going on, or participants describe the instructional as one who has eyes on the back of his/her head Participant is a generic term to include anyone the instructional is supporting, such as: PreK-12 participants, adult School is used generically to represent participants, teachers, staff, or other colleagues in the instructional s area of Levels: (choose one) Demonstrating withitness Strategy was called for but not exhibited. Uses strategy incorrectly or with parts missing. Uses behaviors associated with withitness. Uses behaviors associated with withitness and monitors the effect on behavior and school climate. Adapts and creates new strategies for unique needs and situations. 22 12. Acknowledging Adherence to Rules and Procedures consistently and fairly acknowledges adherence to rules and procedures. Instructional provides nonverbal signals that a rule or procedure has been followed: Smile Nod of head High five Instructional gives verbal cues that a rule or procedure has been followed: Thanks participants for following a rule or procedure Describes participant behaviors that adhere to rules or procedures Instructional uses tangible recognition when a rule or procedure has been followed: Certificate of merit Token economies Sample Participant Evidence Participants appear appreciative of the instructional acknowledging their positive behavior When asked, participants describe the instructional as appreciative of their good behavior When asked, participants report the instructional fairly and consistently acknowledges adherence to rules and procedures Participant is a generic term to include anyone the instructional is supporting, such as: PreK-12 participants, adult School is used generically to represent participants, teachers, staff, or other colleagues in the instructional s area of Levels: (choose one) Acknowledging adherence to rules and procedures Strategy was called for but not exhibited. Uses strategy incorrectly or with parts missing. Acknowledges adherence to rules and procedures consistently and fairly. Acknowledges adherence to rules and procedures consistently and fairly and monitors the extent to which these actions affect behavior. Adapts and creates new strategies for unique needs and situations. 23 13. Understanding Participants Interests and Backgrounds uses participants interests and backgrounds to produce a climate of acceptance and community. Instructional has side discussions with participants and colleagues about events in their lives Instructional has discussions with participants and colleagues about topics in which they are interested Instructional builds participants interests into their interactions Sample Participant Evidence When asked, participants and colleagues describe the instructional as someone who knows them and/or is interested in them When asked, participants and colleagues say they feel accepted by the instructional Participant is a generic term to include anyone the instructional is supporting, such as: PreK-12 participants, adult School is used generically to represent participants, teachers, staff, or other colleagues in the instructional s area of Levels: (choose one) Understanding participants interests and backgrounds Strategy was called for but not exhibited. Uses strategy incorrectly or with parts missing. 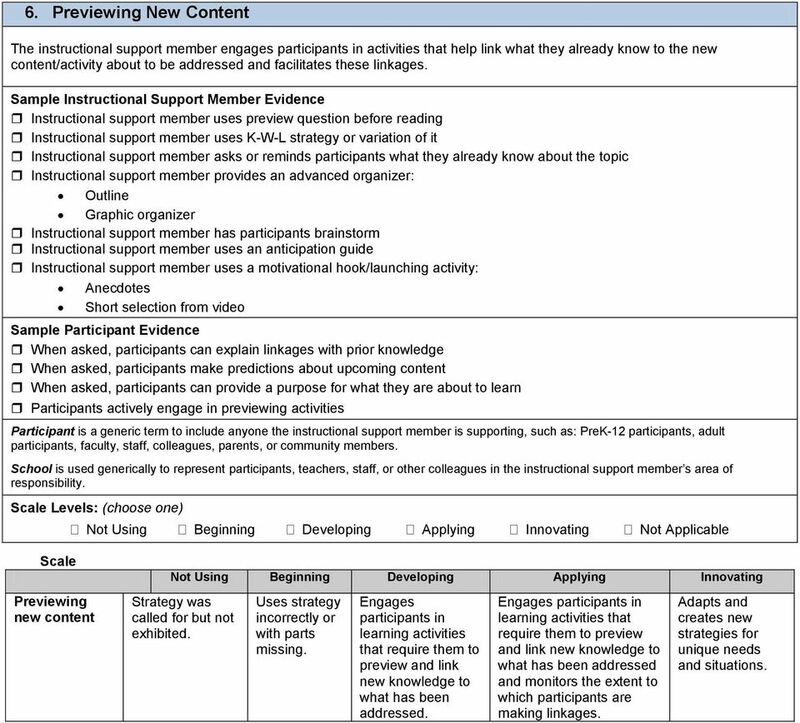 Uses participants interests and backgrounds during interactions with participants. Uses participants interests and backgrounds during interactions and monitors the sense of acceptance and community. Adapts and creates new strategies for unique needs and situations. 24 14. Using Verbal and Nonverbal Behaviors that Indicate Affection for Participants When appropriate, the instructional uses verbal and nonverbal behavior that indicates caring for participants or colleagues. Instructional compliments participants and colleagues regarding academic and personal accomplishments Instructional engages in informal conversations with participants or colleagues that are not related to academics Instructional uses humor with participants and colleagues when appropriate Instructional smiles, nods, etc. at participants and colleagues when appropriate Sample Participant Evidence When asked, participants and/or colleagues describe the instructional as someone who cares for them Participants respond to instructional s verbal and nonverbal interactions Participant is a generic term to include anyone the instructional is supporting such as: PreK-12 participants, adult School is used generically to represent participants, teachers, staff, or other colleagues in the instructional s area of Levels: (choose one) Using verbal and nonverbal behaviors that indicate affection for participants Strategy was called for but not exhibited. Uses strategy incorrectly or with parts missing. Uses verbal and nonverbal behaviors that indicate affection for participants or colleagues. Uses verbal and nonverbal behaviors that indicate affection for participants or colleagues and monitors the quality of relationships during all interactions. Adapts and creates new strategies for unique needs and situations. 25 15. Displaying Objectivity and Control behaves in an objective and controlled manner. Instructional does not exhibit extremes in positive or negative emotions Instructional addresses inflammatory issues and events in a calm and controlled manner Instructional interacts with all participants and colleagues in the same calm and controlled fashion Instructional does not demonstrate personal offense at student misbehavior Sample Participant Evidence Participants and colleagues report they are settled by the instructional s calm demeanor When asked, participants and colleagues describe the instructional as in control of himself/herself in all situations When asked, participants and colleagues say that the instructional does not hold grudges or take things personally Participant is a generic term to include anyone the instructional is supporting, such as: PreK-12 students, adult students, faculty, staff, colleagues, parents, or community members. School is used generically to represent students, teachers, staff, or other colleagues in the instructional s area of Levels: (choose one) Displaying objectivity and control Strategy was called for but not exhibited. Uses strategy incorrectly or with parts missing. Behaves in an objective and controlled manner. Behaves in an objective and controlled manner and monitors the effect of all interactions with participants and colleagues. Adapts and creates new strategies for unique needs and situations. 26 16. Demonstrating Value and Respect for Low Expectancy Participants exhibits behaviors that demonstrate value and respect for low expectancy participants. When asked, the instructional can identify the participants for whom there have been low expectations Instructional provides low expectancy participants with nonverbal indications that they are valued and respected: Makes eye contact Smiles Makes appropriate physical contact Instructional provides low expectancy participants with verbal indications that they are valued and respected: Playful dialogue Addressing participants in a manner they view as respectful Instructional does not allow negative comments about low expectancy participants Instructional sets high expectations for all participants Sample Participant Evidence When asked, participants and/or colleagues say that the instructional cares for all participants Participant is a generic term to include anyone the instructional is supporting, such as: PreK-12 students, adult students, faculty, staff, colleagues, parents, or community members. 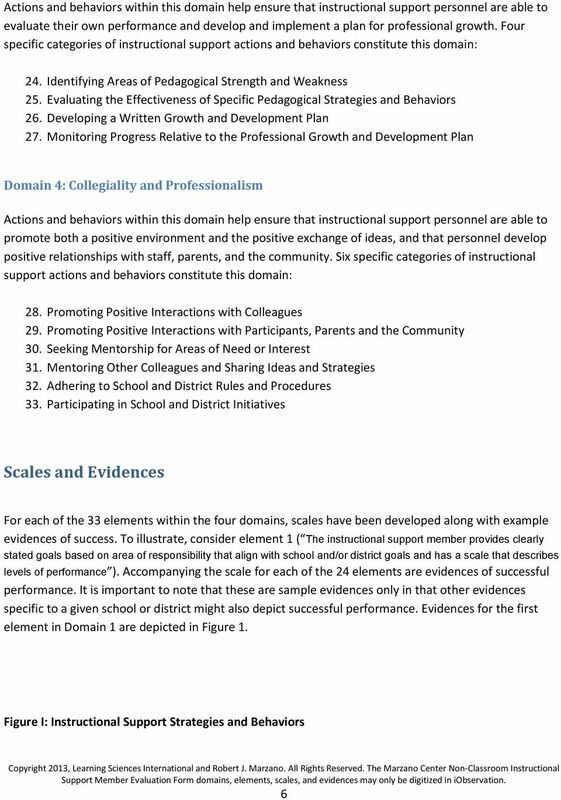 School is used generically to represent students, teachers, staff, or other colleagues in the instructional s area of Levels: (choose one) Communicating value and respect for low expectancy participants Strategy was called for but not exhibited. Uses strategy incorrectly or with parts missing. Exhibits behaviors that demonstrate value and respect for low expectancy participants. Exhibits behaviors that demonstrate value and respect for low expectancy participants and monitors the impact on low expectancy participants. Adapts and creates new strategies for unique needs and situations. 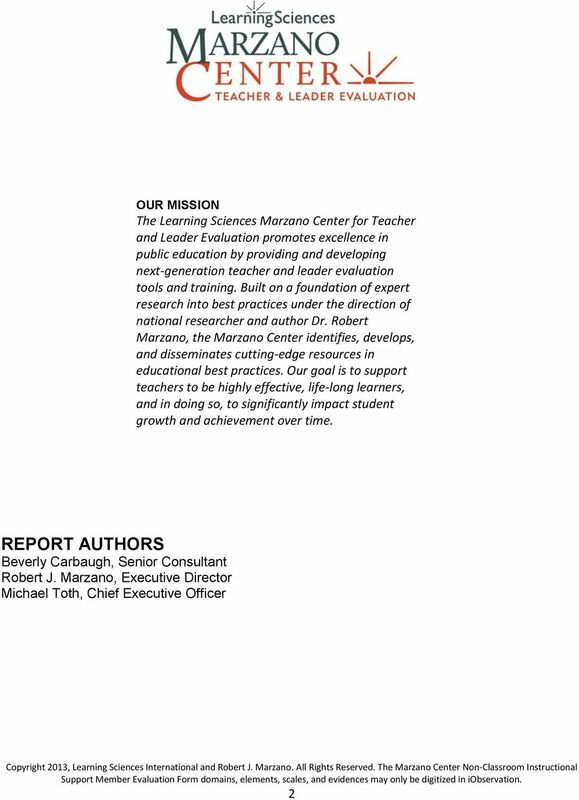 Using Rounds to Enhance Teacher Interaction and Self Reflection: The Marzano Observational Protocol Marzano Research Laboratory 9000 E. Nichols Ave. Ste. 210 Englewood, CO 80112 October 2009 Robert J.
I. Students succeed because teachers plan with individual learning results in mind. 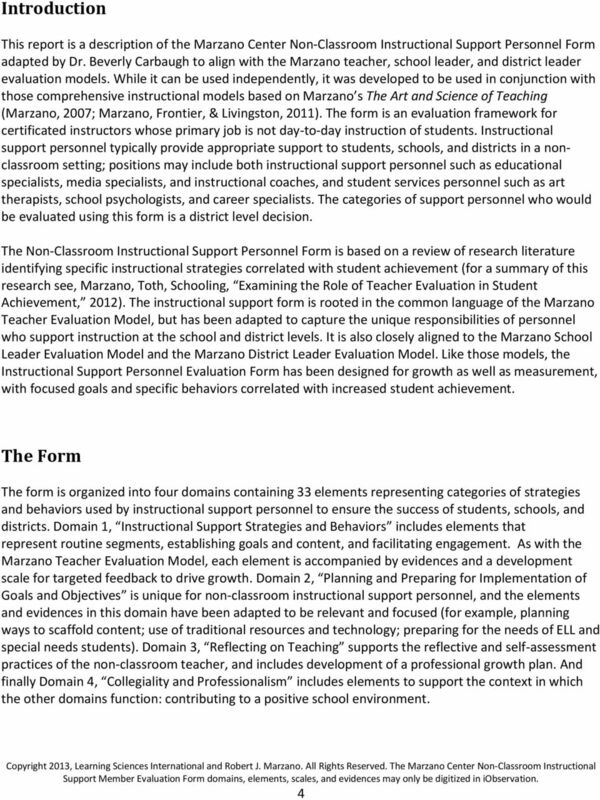 The Marzano Framework Design Question 2 Elements 6-13 Helping Students Interact with New Knowledge :8#!!"#$"%&'()*+#,"-.&%'"%/'0++/)"12'3#&-&1&4!.3#&*.;.#$!*8#!#?!$*46*#(.#$!4#,#6-#3!@?!4#$#6478!;%4!#;;#7*.,#!*#678.&(!94#$#&*#3!.&!6!4%@0$*A!#6$?B*%B0&3#4$*6&3!)%3#-! Exemplary Planning Commentary: Elementary Literacy! This example commentary is for training purposes only. Copying or replicating responses from this example for use on a portfolio violates TPA policies. Session One: Increasing Comprehensibility One goal for every teacher working with ELL students is to increase comprehensibility. In other words, to increase understanding or make course content more intelligible. Collier County Public School District Principal Mentor Handbook Masterful mentors inspire people by helping them recognize the previously unseen possibilities that lay embedded in their existing circumstances. Ribas Associates and Publications, Inc. 9 Shermans Way Westwood, MA 02090 Phone: 781-551-9120 Fax: 781-349-8160 Email: info@ribasassociates. Copyright 2005 by Washington Office of the Superintendent of Public Instruction. All rights reserved. 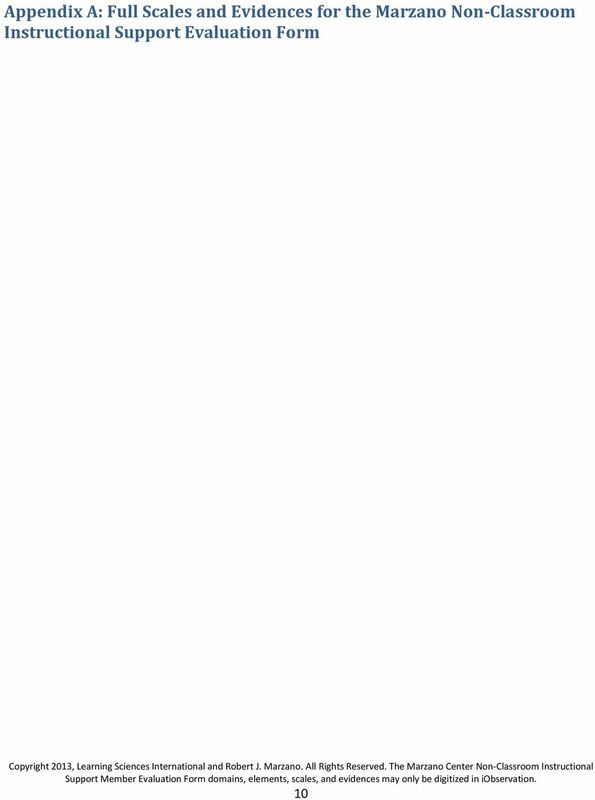 Educational institutions within the State of Washington have permission to reproduce this document.